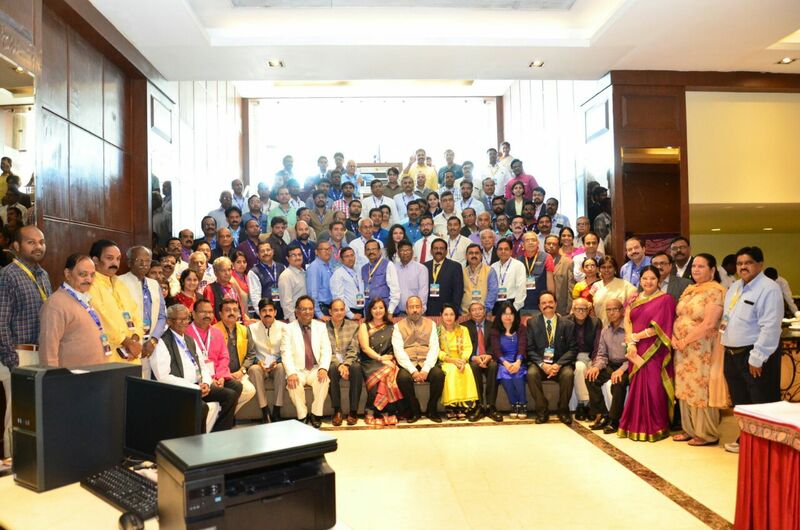 The Public Relations Society of India (PRSI), 39th All India Conference inaugurated here on Friday in the presence of 200 PRSI professional members. The conference was inaugurated by AP HRD Minister, Ganta Srinivasa Rao in the presence of Anakapalle MP, Mr. M. Srinivasa Rao, PRSI National President Dr. Ajit Pathak, AU former Rector Prof. A. Prasanna Kumar, PRSI Secretary General Nivedita Banerjee, Vice-President (South) U.S. Sarma, Chapter & Conference Chairman Prof. DVR Murthy, Secretary PLK Murthy and other senior PRSI members. As a part of National Conference, the Chief Guest presented the National Awards to various public and private sectors. The conference organizers planned to arrange various sessions in the coming two days. Second day: 16th December 2017. The first session has started with the presence of CEO of Adfactors PR, Mumbai Mr. Madan Bahl as the session chairperson. The panelists were Shri Nitin Killawala, Shri Subodh Dakwale, and Dr. Pragnya Ram. The first presentation was made by the Executive Director (Corporate Communications & Branding), Indian Oil Corporation Ltd. Mumbai Shri Subodh Dakwale who spoke on “Smart Outlets and Refreshing Branding for Smart Cities. He spoke that in near future we will be using smart technologies everywhere. Effectiveness in communication can bring progress in living a life in a better way. In this context, he described various advanced techniques like petrol station, digitalized innovations, branding through digit media apps and many other fine concepts with respect to the prestigious Indian Oil Corporation. The second presentation was deliberated by the Architect and Designer Shri Nitin Killawala from Mumbai and spoke on “Smart thinking for cities”. He told that people are exercising smartness out of compulsion which leads to high urbanization. He spoke about slum-free- environment by quoting few examples of Mumbai where gradually real estate business has bloomed. He also spoke about economic paradox by explaining in detail with a line of “we are rich but poorer in terms of standard of living”. He gave a brief description of some government initiatives such as Pradhan Mantri Awaz Yojana, etc.. He referred to some issues like Land Monetization by metro, a dark side of housing politics, etc… He gave a conclusion by giving Social housing as infrastructure project which can create a solution for this Smart cities project. The third panelist was the Group Executive President- Corporate Communications and CSR Aditya Birla Management Corporation Pvt. Lmt., Mumbai Shri Dr. Pragnya Ram. She addressed the august gathering with her theme of “CSR for Smart Society”. She rightly focused on the need of the hour where the importance of CSR is being widely noticed. She says that CSR should not be something out of business mode rather it should be from your heart. She advised everyone to revisit the definition of Smartness as it lies in the humanity of the people around. She gives some statistics regarding the student dropouts belonging to 11-13 years. She concluded by saying smartness should be present in all aspects of the society. The second session has been put forth by the Chairman of Visakhapatnam Port Trust of Visakhapatnam Mr. M.T. Krishnababu. The panelists were Mr. K.G. Suresh, Mr. Nazeeb Arif, and Mr. Daniel Chellappa. The first chairperson for this session is Director General of Indian Institute of Mass Communication New Delhi Mr. K. G. Suresh. He dealt with a concept of “Foundation for Smart Cities in India”. He spoke relevant aspects which are related to the present day facts about how we carry our day to day life of using technology to keep us updated. He said that we are in a technological era where everything can be massed under one roof. He said that smart communication is something which has to come out of Responsible communication and people from every walk of life are using technology. He also described that smart cities are those which have smart mindsets of the citizens. He countered that research has been replaced by Google search. Therefore, he concluded that technology has taken everyone along. The next discussion was by the Senior Scientist (TCW), Bhabha Atomic Research Centre (BARC) Government of India Chennai Mr. Daniel Chellappa. His topic was on “Science and Technology- Backbone of building Smart cites”. He spoke about the role of advanced technologies in various sectors of the society. He shared the relevant information on this topic regarding Technologies for safe drinking water, development of unique membrane-based water purifiers, desalination of sea water, online availability of domestic water purifiers, nanocomposite ultra filtrations etc.. He also mentioned few effective water treatments using charged nano-filtration and membrane pouches. The last panelist was the Vice- President (Corporate affairs) ITC Kolkata Mr. Nazeeb Arif. He said that conservation of natural resources, mountains, hills, natural formations, fossil fuels, etc.. bring true meaning for the mankind. The renewable resources are to be used by showing sensitivity to conserve them. He shared few interesting facts like it is a common perception that Rajasthan is a desert region full of sand dunes but there existed a man-made river which has been quite essential during drought times and helped the local natives who are resided in the nearby areas. He concluded by saying that ITC has been showing concern in transforming the lives of many destitute. The session-3 has the Vice- President (East), PRSI Ms. M. S. Mazumdar as the session chairperson with panelists such as Mr. O. Naresh Kumar, Mr. Anuj Dayal, Mr. Rajeev Goel and Mr. Neelesh Taunk. The first part of this session was taken by the CEO of Symbiosis Technologies Mr. O. Naresh Kumar. He spoke on the theme of “Metro Rails for Developing Smart cities”. He roughly gave the statistics of the city of destiny, Visakhapatnam. He quoted few examples of a most livable city. As Melbourne is confined as the most livable city but when it comes to the scenario of our country we do not have good cities which can be called as most livable, we have Hyderabad which has been globally ranked 144 in Andhra Pradesh. He concluded by saying that crime rate, security, availability of daily needs like food water shelter, equal distribution of wealth and natural resources and many aspects are to be taken into consideration while analyzing a smart city. The closing ceremony has PROF. K. HARIBABU, Member of Parliament as the Chief Guest for the day. He stated that there will be soon introduction of Electrical Vehicles with the support from Central Government. He also focused on Energy conservations of Natural Resources. The second day has been constituted with three effective sessions. The first session was put forth by Prof. DVR Murthy as the session chairperson with panelists like Mr. Jatin Trivedi, Mr. Nori Prabhakar, and Dr. Sandeep Chatrath. The person to speak was the dignitary from Trivedi & Co. Ahmedabad Mr. Jatin Trivedi who spoke on “IPR and Communication”. He differentiated between Intellectual Activity and Intelligent Activity. He spoke on Characteristics of IP, Trademark registrations criteria, Case studies on Intellectual Properties, etc.. The second dignitary to speak was the Chief General Manager (PR & Branding) BPCL Mumbai Mr. N. Prabhakar who spoke on the topic of “Customer Care- Winning the Trust”. He shared few smart ways to reach one’s own customers, effective communication with customers, etc.. The third panelist was the CEO of Apollo Hospitals of Andhra Pradesh and Telangana Dr. Sandeep Chatrath. He spoke widely on “Management of Smart Health Care”. He stated that the basic needs to live are food, clothing, and shelter. Therefore, he cited few renowned services which are rendered by the Apollo Group of Hospitals for the well being of the common people. The second session bared panelists such as the Executive Director of Indian Oil Corporation Bhubaneshwar Mr. P. C. Choubey, the Executive Director of HPCL Vizag Refinery Visakhaptnam Mr. Prasad Sarma and the Group General Manager of NTPC Visakhapatnam Mr. N. K. Sinha. The session has the Central Information Commissioner Government of India New Delhi Prof. Madhabhushi Sreedhar who spoke on “Right to information for Smart Governance”. He elaborately spoke about the Smartness of the cities. He said that smartness should be in the mindsets of the people also. The third session continued with the session chairperson as the Vice- President, PRSI Mr. Unmesh Dixit with able panelists such as Ms. Saroj Chelluri, Mr. Satyen Bhat, and Mr. Chakraphani. The first panelist was the Managing Director of Prism Public Relations Pvt. Ltd Chennai Mr. Satyen Bhat who spoke on “Smart Public Relations: Smart Organization”. This panelist broadly spoke on the Smartness property by citing examples of certain companies which have grown exponentially because of adopting, adapting and improving their own systems both nationally and internationally. He said that we all should embrace technology and spoke on the concept of Artificial Intelligence. The second panelist was the General Manager (Technical) NTPC Simhadri Ms. Saroj Chelluri who spoke on “Power Management for Smart Cities”. She came out with relevant smart ideas to use technology in order to conserve natural resources by using renewable natural resources. She said that we are in a situation of “I want power when I want it”. She said that Smart energy drivers, Internet of energy, effective load management, smart control systems, smart grid systems, smart demand responses, etc.. which would yield good results to Power Management in smart cities. The last panelist for session 3 was the Deputy General Manager of Devlok Project Tirupati Mr. Chakraphani who acknowledged people with the Devlok project which has to be established in near future. The Devlok project has initiated in Tirupati which is a complete man-made spiritual world consisting of mythological aspects and as well as entertainment part. He spoke about certain characteristics of this eminent Devlok project which comprises of certain elements like idols of spiritual gods, leaders, Sagaramadanam, fountains, Kamadehenu food court, Neelakanta waterfalls, etc.. This Devlok is going to be an extra-ordinary funda for the people. The Valedictory session has continued after the above sessions. The Member of Parliament, Dr. Kambamphati Hari Babu has been the Chief Guest for the Valedictory session. The Director-General, Delhi Police Shri Vasudeva Rao was the Guest of honor. This session has been presided over by the Central Informational Commissioner, Government of India New Delhi Prof. Madhabhushi Sreedhar. The conference was rounded up by the Editor, PR Voice, Hyderabad Dr. C.V.Narasimha Reddi. Dr. K. Hari Babu spoke about the greatness of Visakhapatnam city. He stated that PRSI has rightly chosen the title as “Smart Cities”. He recollected the decision which was made by the leaders such as Venkaiah Naidu who chose Visakhapatnam as one of those smart cities which has to be funded. Therefore, the city has enormously seen keen progress in all developmental aspects. He also said that the Smartness and Neatness should be felt by everyone including the people of the society. He cited few examples such as Hindustan Shipyard Limited, NTPC, etc.. Were very much upgraded and transformed into great leading clean industries. He said that we have many great bodies in Visakhapatnam such as Eastern Naval Command by Indian Navy. He glorified the City of Destiny by giving many live examples of many leading industries sustaining in the city.